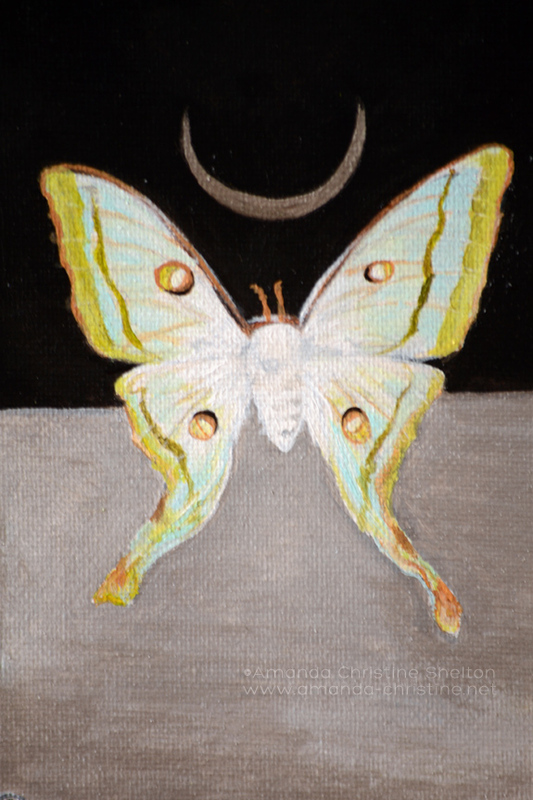 Specimens 1 & 2 are moth studies, and some of the first completed pieces of 2013. They are both 5x7" and framed in frames with thick decadent molding which offsets the metallics. Specimen 1 is based on the Indian Moon Moth, similar the Luna Moth I have been fascinated with for some time. Both silver acrylic and silver liquid leaf are used in the background. 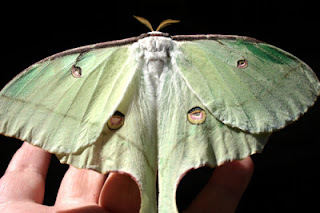 This photo is from August 2010, when I encountered a female Luna moth (still full of eggs) one morning on a porchlight, funny enough after speaking with a man at a farmers' market who sold pinned butterflies and moths at a vendor booth. But this Luna let me shoot her for some time and perched on my hand without fear. This was actually the first time I had even seen this species in person, but we do get heavy populations of monarchs from living in a milkweed-covered county. 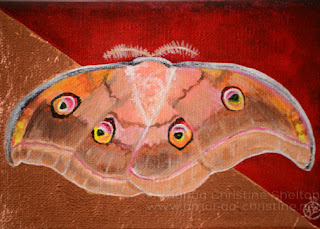 Specimen 2 is based on the Emperor Gum Moth. With this one I wanted to bring out the colors, play up the pink/red tones reinforced through the copper leaf and background- it has more creative twists and license taken... and it kind of makes me think of a Valentine for bug lovers. During February these are available at Sauced on Paseo in OKC. They are also $48 each so they could be a nice Valentine gift.